Departments are functional subdivisions of the denominational work on various administrative levels of the church. They are arranged to promote and guide specific areas of denominational activities. They also provide resources, training and support for local churches, educational institutions, groups and ministries throughout Trinidad. The conference departments and officers that serve our constituents. Contact the department office directly for more information, get in touch with us. If needing forms, documents and event registrations check here first. Adventist Development and Relief Agency (ADRA) headquartered in Silver Spring, Maryland, is the global humanitarian agency of the Seventh-day Adventist Church. Visit ADRA site for more information. The Children’s Ministries department provide multiple resources that aid in developing children to become citizens of the kingdom of God by providing religious education to children. The mission of the Children’s Ministries Department is to nurture children into a loving, serving relationship with Jesus.. The office of Communication's primary purpose is to effectively communicate news and information to members of the conference and the public at large. The department also strives to train, support and guide church communication leaders to effectively develop a positive image with the public. Communication concentrates on creating a positive reputation for the Adventist Church among non-members and creating a positive reputation for the local conference among members. The Community Services Department is the humanitarian agency of the Seventh-day Adventist Church that works within our island. We work to meets people's immediate needs when affected by natural disasters or circumstances of life. 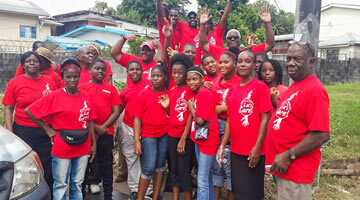 Our social services includes health outreach services and disaster response. In the past we have provided homes for senior citizens and abused children. It purposes to build a trust relationship between the Church and community by providing assistance to persons in need, without reference to race or religious affiliation. The Education Department governs and provides administration and direction for educational institutions within the conference. The primary aim of Adventist education is to provide opportunity for students to accept Christ as their Savior, to allow the Holy Spirit to transform their lives, and to fulfill the commission of preaching the gospel to all the world. Family Life Department works to develop resources, coordinate and promote training events, and provide networking opportunities for those who work on behalf of the family in our conference. It provides resources that assist church leadership in assessing the needs of church members for family life education, enrichment, and counseling; and in developing a plan for utilizing community and church resources to address these needs. Working together with church leadership, programs are designed and implemented to improve the quality of family life features and programs as needed, both for family nurture within the membership and evangelistic outreach to the community. The Health Ministries Department is to help men and women reach their full potential, mentally, spiritually and physically. Health Ministry is the gospel of Christ illustrated, the message of God practiced. Without it, the gospel witness is muted; it is merely a theory, an idea. This department coordinates the health education and health promotion drive in the local church. The department also sponsors temperance and health evangelism and other outreach programs. The Ministerial Secretary office is to equip pastors and those involved in ministry to achieve their highest personal and professional potential. This includes but is not limited to, spiritual growth & maturity, pastoral & nurturing ministry, evangelism & church growth, global mission & church planting, ministerial resources & continuing education, strengthening and supporting the pastoral family. Visit the Department page here. Men's Ministries exists to encourage Christian fellowship and spiritual renewal among the men within the conference. This is provided by a range of activities targeted to bring together men. We're here to help all men become true to God. Through bible studies, book, outdoor events, community service and devotion. The department exists to serve the needs of the men of the church and beyond in the island of Trinidad. Personal Ministries Department's primary focus is evangelism. Its goal is to help prepare men and women for the kingdom of glory. The Publishing Department of gives leadership to the work of the publishing entities such as the Adventist Book Centers, literature evangelists and provides support for publication and distribution of literature printed by our publishing houses. We believe the publishing work was ordained to play an important role in sharing about Jesus Christ through the medium of print. The department actively supports the rights of new and existing Adventists believers to express their religion without hindrance as governed by the laws of our country. The department also monitors and interprets current events that may reflect prophetic scenario. The purpose of the Sabbath School is to make disciples for Christ. It includes the nurture of spiritual growth in members and prospective members, as well as the friends who join in the fellowship, study, sharing and service. The Sabbath School exists not only to minister to its members, but to train its members to minister to others. The Sabbath School is a school of Christian living, not just an event on Sabbath mornings. Sabbath School is a special time for study of the Word of God. Most Sabbath Schools have programs for all ages, beginners through adult. The conference Sabbath School department serves as a resource for your Sabbath School. Our goal is to teach and preach God's principles for handling money. To provide resources for the local church to aid in personal and church finance. Our constituency is provided with information and educational material to inspire members to financial faithfulness. Information on tithes and offerings and related matters are also available from this department. The objective of Women's' Ministries is to help the women of the church experience Jesus Christ in a personal, life-changing relationship. When Jesus calls us into a relationship with Him, He also calls us to ministry - some type of service to others. As women become actively involved in ministry, the entire church is blessed.The department exists to serve the needs of the women of the Church and beyond in the island of Trinidad. To know Jesus passionately and to disciple and serve women. The Field Secretary provides a service to the corporate church. Besides advising the Administration, the Field Secretary also provides inter-departmental assistance and cooperates with the departments in a number of projects and ventures. The Field Secretary also provides biblical and theological information in response to various issues. He answers questions received through the website and creates resources for bible study. The Evangelism Coordinator manages the evangelism thrust of the local conference and aids the pastors and church leaders in providing resources, and fresh ideas for the preaching of the Three Angels Message, the everlasting Gospel of Jesus Christ, and His imminent Second Coming. Early childhood care education, school ministries, adult education and Associate Education director. Occupational safety and health, church beautification, special needs.